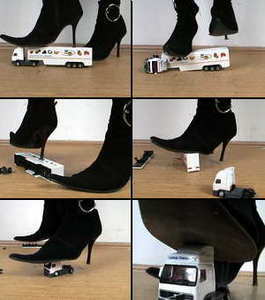 Adorned with sharp black boots this giantess uses all of her weight to crush her collection of toy trucks under her feet. She loves seeing the small parts scatter across her finished floor. She is stomping on it until they are in little pieces. With her petite body, one would never think that she had that much power.